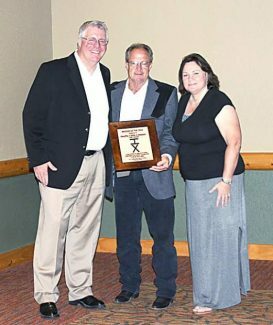 Grapevine, Texas – Recognizing the contributions to the Red Angus breed and the continued pursuit of excellence, Hueftle Cattle Co., Neil and Anita Hueftle, Cozad, Nebraska, were honored as 2015 Breeder of the Year at the 2015 Red Angus Association of America National Convention. Lee Leachman, Ft. Collins, Colorado, made the presentation. In accepting the award, Anita expressed her gratitude for the recognition. "We are humbled to be selected and thank you for presenting us with this award," she said. "We feel privileged to be a part of the association." Cattle have long been a part of the Hueftle family farming operation. Through the early years, Neil's father had other breeds of cattle, and initially when Red Angus came to the farm, it was as the opportunity to partner as a cooperator herd for other breeders. In 2004, Neil and Anita began selling Red Angus bulls under the HX brand. Currently Hueftles, along with their three sons, host a bull sale each March.